what you may ask is an "apple slump"? well, it's basically an apple cobbler. 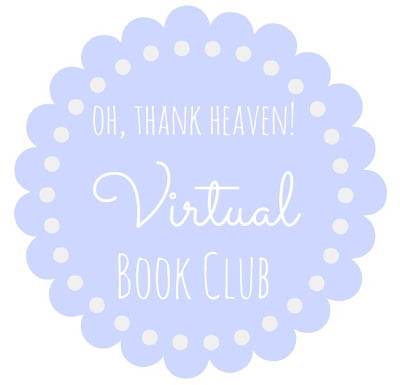 why are we doing it for virtual book club? well, this was a popular new england dessert in louisa may alcott's day and her family quite liked a recipe similar to this. on a side note - i guess because of the lovable (but homely) characteristics of both the dessert and her house, louisa nicknamed orchard house "apple slump". funny, huh? they sell souvenir copies of the recipe at orchard house if you ever find your way there. i had every intention of actually making and trying out this recipe but its july. it's too hot to turn on the oven and have a warm apple dessert. it's just not autumn yet - even if i want it to be. so here is the recipe for you to try out once the weather cools down a bit. 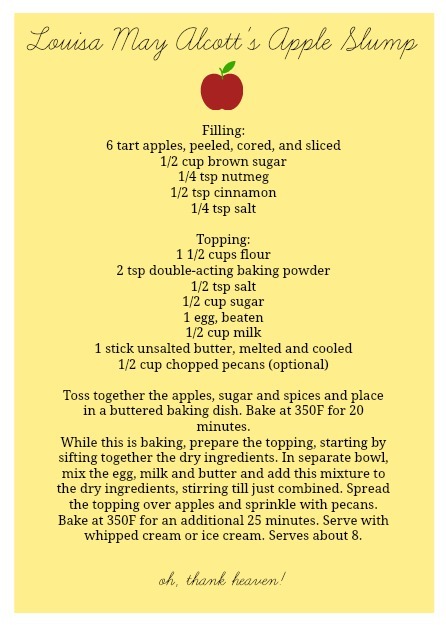 wouldn't it be fun to go apple picking and then make this old-fashioned dessert from those fresh orchard apples? how far are you in your reading? any suggestions for next month's book?? recipe adapted from here. also that fun little tidbit about orchard house. hey folks! my birthday is this week! so today i'm doing a round-up of birthday themed things i think are really cool! 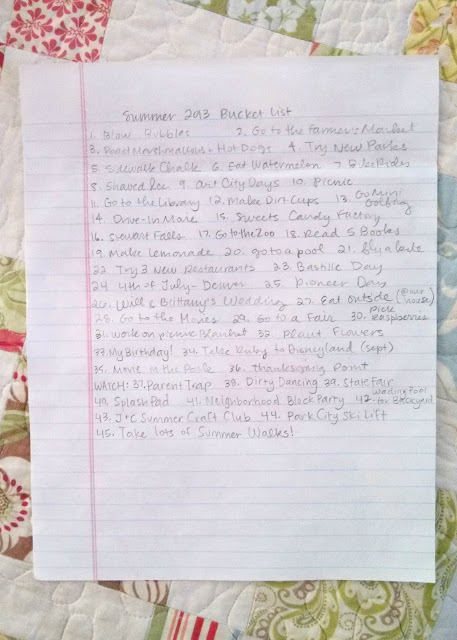 1. this birthday party in a box idea from you are my fave is so fun. i love her whole "in a box" series. 2. the sweet tooth fairy has a birthday cupcake club! 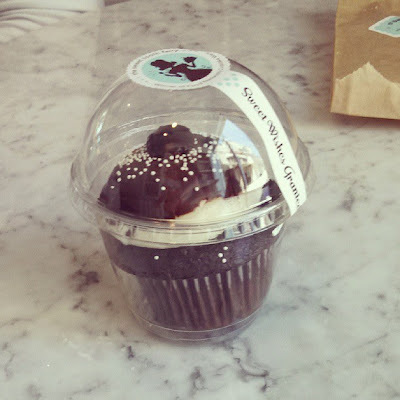 if you go into the shop and fill out the form for the birthday club, you get a free cupcake on your birthday! am i childish if the 'fairy-fetti' is my favorite? 3. the original princess diaries movie came out right around my 13th birthday and going to the movies was my birthday activity that year. i love that movie. still do. probably always will. 4. i've never been to disneyland on my birthday, but i've been on it's! dan and i went on july 17, 2011 - disneyland's 56th birthday. it was magical. as disneyland often is. 5. i was supposed to be born on 8-8-88 but i was a week early. wouldn't that have been the coolest birthday ever? 6. how cute is this little birthday clothespin doll? i've got to make one like this. these dolls are so much fun to make! 7. i think birthday traditions are so fun! this list is a pretty good start. 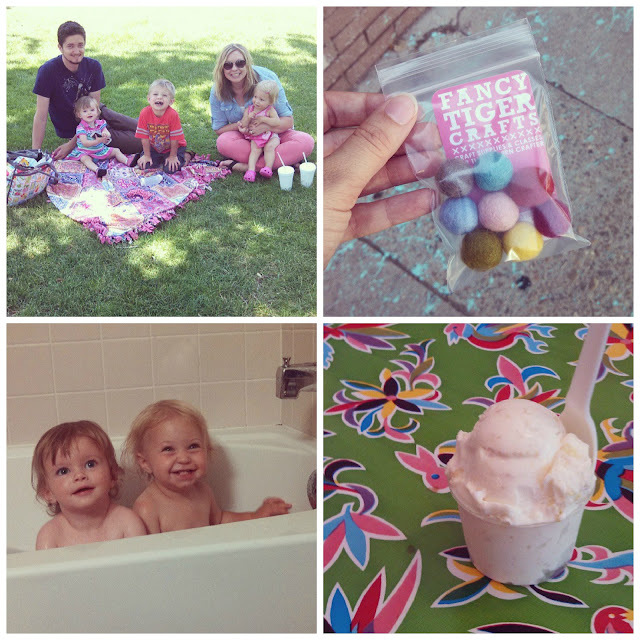 growing up, our tradition was breakfast in bed, but i think we should do more than just that! i love the idea of birthday pancakes. ruby's got a knack for sleeping in only on days when she needs to wake up early. it's kind of ridiculous. we are never on time for 9am church. anyway, friday we were supposed to watch sandra (ruby's cousin) while her big brother, alastor, got "thorns" at the doctors. thorns = 5-year-old-shots. it was 9:30 and ruby was sound asleep. but as soon as sandra came in to say 'good morning ruby!' she was up and ready to play. as you can see, ruby is in her jammies, hair uncombed and i think she has a soggy diaper. she refused breakfast. she (finally) had a playmate around and was going to play! the girls got a long pretty well until they both wanted to play with the same dollie. i snapped these photos really quickly just because these girls were being so sweet playing with the blocks together. it will be so fun to see them grow up and become even better cousin-friends! 1. new girl is on netflix instant streaming. i'm already half-way through the first season and i just discovered it was on there tuesday. this is one of the few shows that i actually laugh out loud to. it's so darn funny. 2. my craft room in the up up stairs is finally clean and organized again and as soon as the weather cools down i'll start doing some more crafting up there. it's so nice to have a place where i can close the door and my unfinished projects will remain undisturbed until i can get back to them. 3. have you tried the blueberry simply lemonade? i've always been a fan of the raspberry simply lemonade but this blueberry one is ahead in the polls right now. 4. my birthday is next week! 5. ruby might have a crush on our neighbor boy, dex. all i can say is she kind of might have kissed him. 6. we had a little girls night out down at my friend deb's barn in payson. can i just say how picturesque rural farm life is? it really is so beautiful down there. 7. we had some new friends over last night - the jensens. it was really fun and i made chicken pot pies. 8. i'm so excited for this movie. well, i think eight things is pretty good! happy weekend - we are going to spend it relaxing (i hope!). how far have you gotten in your reading? i haven't really gotten that far but that's beside the point... i'm still trying to figure out this downloadable printable thing so I hope this actually works! 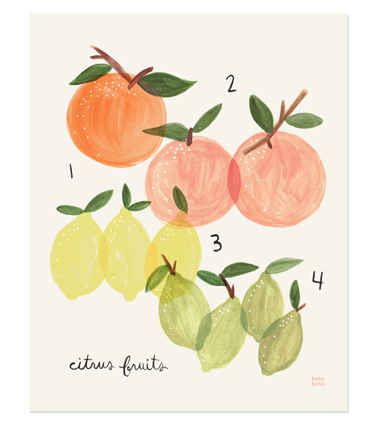 but here is a cute little watercolor that you can print out, slap in a frame and put on your desk! or wherever you please. this originally was an 8x10 so i'm hoping it will be about that size when it's time to print. let me know if it works for you. just click on this link to download (it won't have the red headings on it). tonight, we're going to the annual uncle dutch pioneer day extravaganza! it will be a fun time filled with food and fireworks! 1. whenever i ask ruby to say "mama" she says "dada". without fail. she only says mama when she is in distress or really sad. 2. ruby's still looking for dogs out the window. she is only tall enough to barely see out the window while she's standing on her tippy toes. it's a pretty cute. for some reason, this girl thinks the entire outside world is filled with dogs just waiting to walk by her window. 3. ruby is really happy when she gets her hands on the tv remote and can change the channels. she inevitably changes it to a spanish language station and then loses interest in channel surfing. 4. we've figures out this fun game for when we're driving in the car - i've got this mirror that faces ruby in the back seat. i can see her in my rear-view mirror and we'll drive down the road and just wave at each other. she gets a big kick out of it too. 5. whenever ruby is getting a piggyback ride, she'll hold onto dan's ears. i guess they are pretty convenient handles. if dan looks like shrek or stephen colbert in a couple of months, you'll know why. here are four of the artists i've discovered online that i just love. their work inspires me and i hope it inspires you too! 1. the black apple - i love her whimsical style. 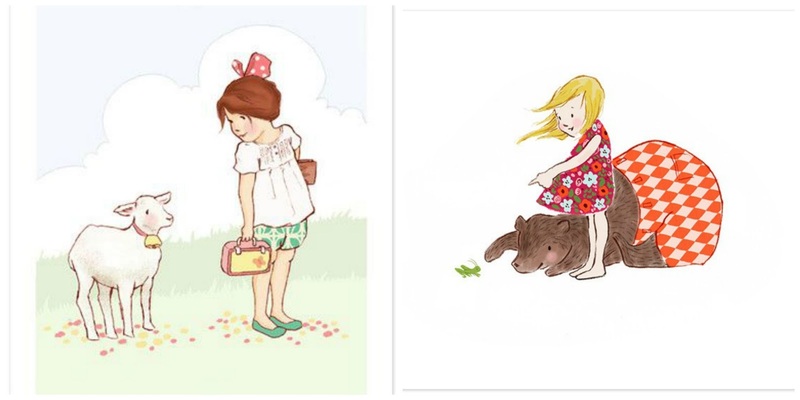 the flower girl series (which these are just a part of!) are my absolute favorite. she has a lot of other fun things too - check out her blog & etsy shop! 2. sarah jane studios - her tagline is "illustrating childhood" and i think it's dead-on. her style is so sweet. her blog is one of my favorites and her shop is really dangerous because i want everything in it. oh, and she's got more than just prints - she has embroidery patterns and fabric with her designs on them. so cute. 3. katie daisy - oh, where do i start with katie daisy? 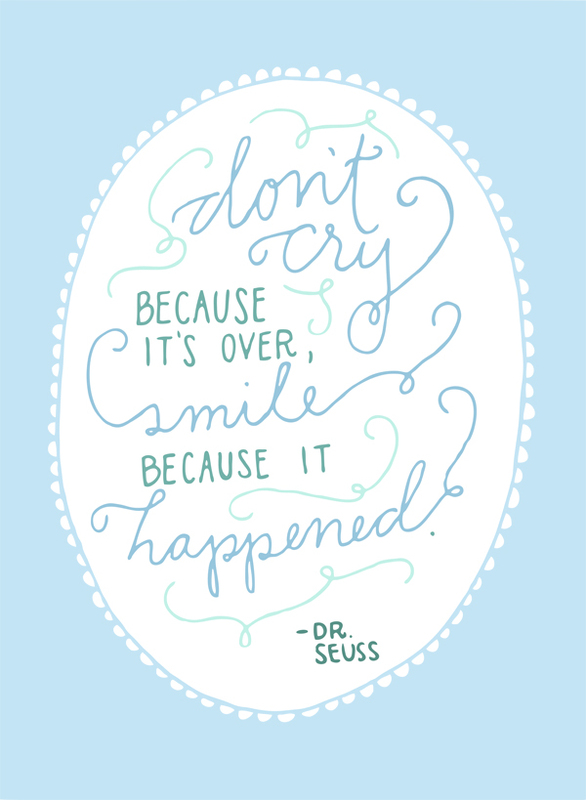 i love her sayings and phrases. her style is so fun and i love her use of colors! check out her blog and etsy shop! 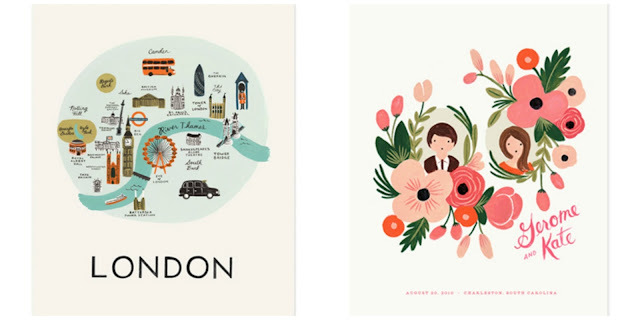 4. rifle paper co. - this is a recent discovery (although upon further investigation, i've liked their stuff for years). 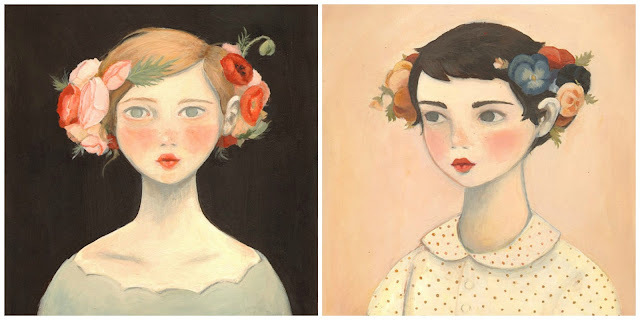 i especially love the vintage style and the way they paint flowers. here's the link to their shop. oh and if you're looking for something fun to do with your nails check out this rifle paper co. inspired manicure. alright! there are my four favorite artists. who are some of your favorites?? 1. ruby slept in. i really love that she'll sleep until after 9:00 am. she's totally my daughter. 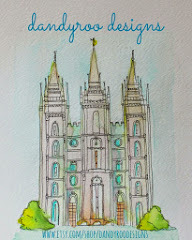 2. i got an email from camille and am totally painting her a dandyroo temple. it's a good thing i read the email in the morning and not the night before or i wouldn't have been able to sleep. 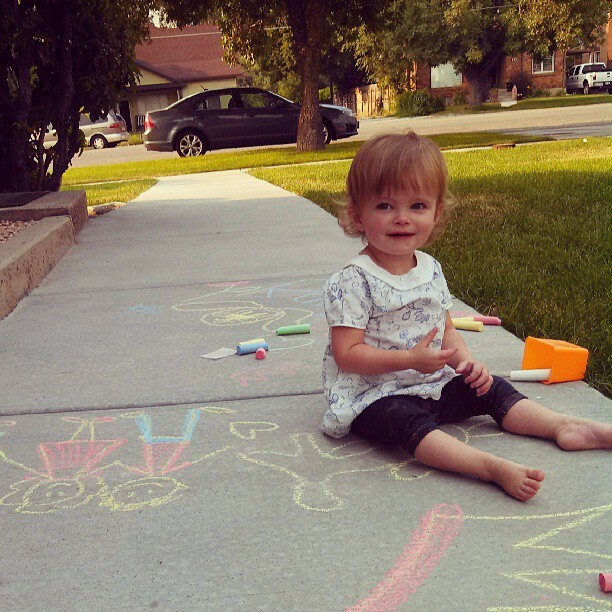 3. ruby and i went for a walk/run around the block. my muscles are just a bit sore and it feels awesome. 4. went to harmony with elise. have you been here? it's so fun and there are so many things to inspire you! i got a couple of rolls of washi tape. 5. went to lunch at cubby's. have you been here?? it's really yummy. i got a grilled cheese sandwich that was out of this world. it had three types of cheese, tomatoes, avocados, carmelized onions and other stuff on it that i can't remember. oh boy, it was good. 6. dan cleaned up the whole house while i was out having fun. that boy really spoils me. 7. ruby took a good long nap. oh goodness. it makes all the difference when ruby takes a good nap. 8. i started (and finished) said painting for camille. guys, it is really so beautiful. i'm not usually this happy with my own work. 9. then camille started following me on instagram. i may have done a little happy dance. 10. we got half-price shakes after eight at sonic. yum. you can't complain about a thing when you can easily count 10 good things that happened that day! happy weekend everyone! we went to denver for the fourth of july and it was so much fun. dan's cousin jason and his family live there. we love visiting them and wish we lived closer. we did a lot of things but i'll let the pictures do the talking! we had a fast-food picnic in the park - it was perfect // we went to the greatest craft store ever. 'fancy tiger crafts'. it was a crafter's heaven. i got these little felt balls to make a necklace or something. we'll see. // ruby and her cousin buddy, millie, in the bathtub! babies in the bathtub are like the cutest thing ever. // we went to this ice cream place called 'sweet action' and i got this honey cornbread ice cream. you read that right. honey cornbread flavored ice cream. it was really so so good. i was pleasantly surprised. we went to the outlet mall and ruby was so happy to carry that bag! she loves shopping. // we went to the denver zoo and saw all the animals. ruby didn't really seem to care about them but we had fun! // we went to jason's office and ruby was really fascinated with the little girl there! on a side note, she is getting so good at cruising along the walls and furniture. // and most importantly, i got a nap. i'd say it was a good vacation indeed! thanks for having us jason, ellen, gavin & millie! we miss you already! 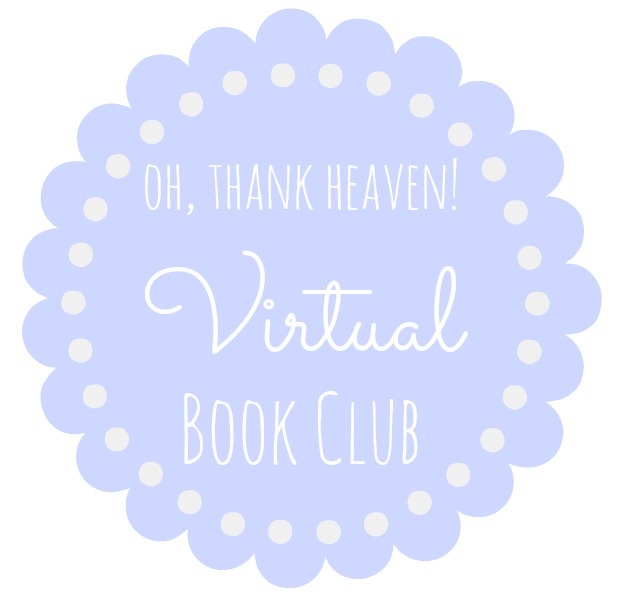 ok, so this idea has been mulling around in my head for a little while - a virtual book club. here's what i am envisioning - who ever wants to can read the book - even though the only person that might participate is my mom, everyone is invited! throughout the month, i'll do some themed posts with crafts and recipes and such. i think it will be so much fun! 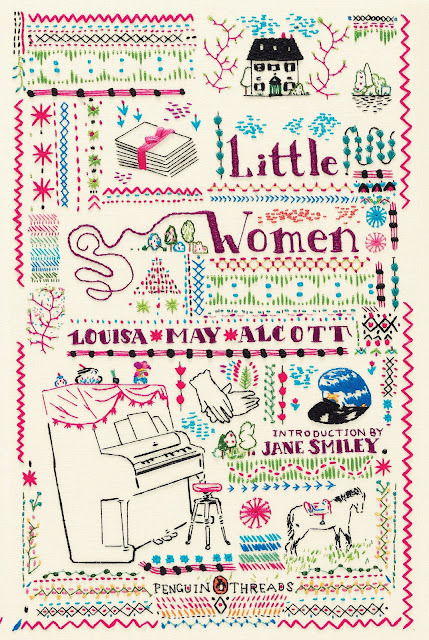 our first book for the virtual book club will be lousia may alcott's little women. ever since we went to concord this past spring and visited the orchard house, i've really been wanting to read this book! i already love the march sisters. i've loved the movie from the time i was a little girl and cry every time i watch it. i figured it was high time i read the book! so do you want to join me? 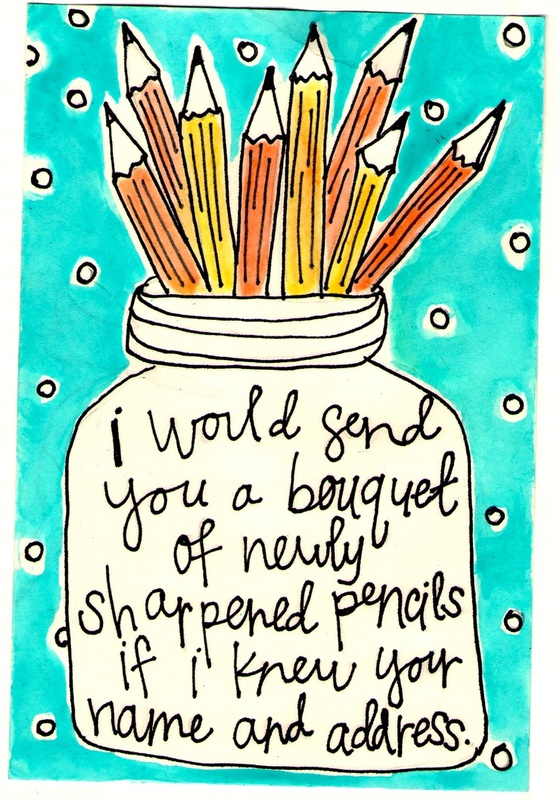 please say you will! here's some inspiration to get you excited. goodness, i love little women. 1. "the bear" - in other lives he's been known as fritz, but he's just called "the bear" in ruby's world. 2. wooden clothespin doll - i made some of these a couple of months ago just because i thought they were so darn cute. a couple of months ago, i put one on ruby's shelf above her changing table and now she wants to hold onto it every time she gets a diaper changed. i kind of have to hide it from her sometimes. 3. mega bloks dump truck - ruby absolutely loves this! her uncle brad and aunt christina gave it to her for her birthday and she makes the cutest little car noises when she plays with it. you can usually find really random things in the dumping part. 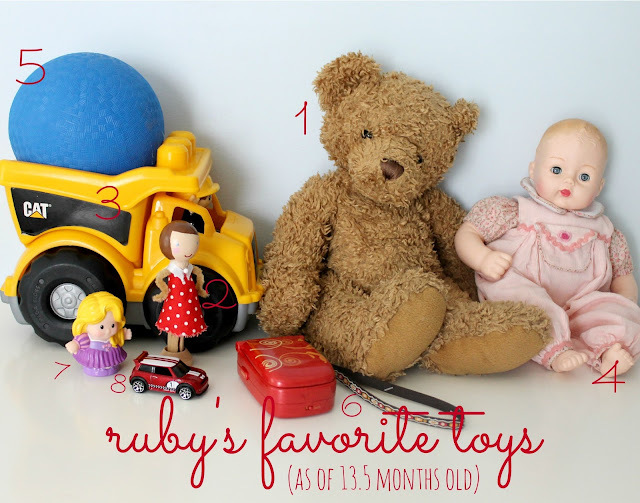 4. ruby's "squeaker" - i had a doll really similar to this one when i was a little girl. ruby gives "baby" the sweetest little hugs and pats on the back. i'll tell her to hug the dollie and she listens and gives her little baby some love. 5. ball - best dollar store purchase ever. 6. play cell phone - ruby is getting to that point where everything is a cell phone. this one actually is one. it's fun because i recorded silly little phrases on it and it rings! 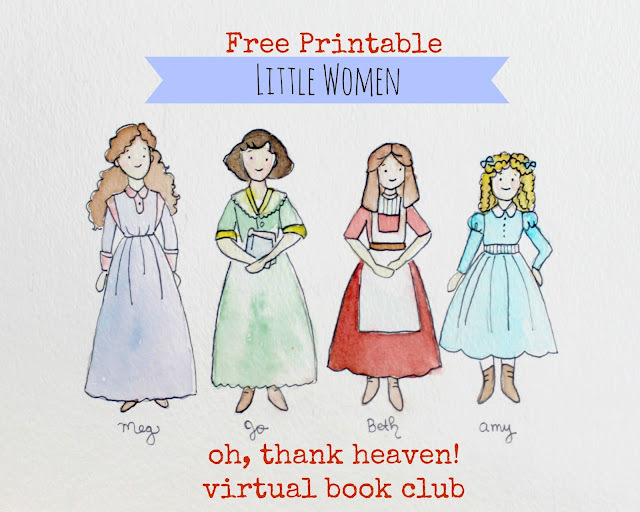 7. chubby little disney princesses - these are so fun and they are perfect to bring along to church and what not. 9. walker - (not pictured, because it clearly wouldn't fit up on her dresser like the other toys) let me tell you! she loves cruising around in her walker, but it's deadly on adult ankles! she's really fast and sometimes i can't jump out of the way fast enough. please note: this totally doubles as a bookmobile! maybe sometime i'll do a "ruby's favorite books" post! because that girl loves books. 1. i can't watch "this old house" without feeling all sorts of homesick for massachusetts. their accents kill me! not to mention the general scenery and new england architecture. and fall is coming up... it's safe to say you can expect a lot of longing for the east coast around here in the near future! 2. i came across this awesome post again and i loved it even more the second time. being new is hard and even though you might not be new, other people are! seriously, such a good read. 3. once one thing gets fixed around this place, another thing gets busted. now, our swamp cooler (the only way we really can cool our house) is broken and the next couple of days are supposed to be in the 100s!! 4. ruby is seriously so funny. she has peek-a-boo down pat. she just can't say "boo" very well. she says "ba". and she's very enthusiastic. it's like it's her grand trick. if you have her do one trick (such as clapping her hands) she'll always finish it off with covering her eyes and a loud "ba"! i'm really going to try to get it on video because it is just so cute. 6. i would love love love to take this class. i really need to learn how to use my camera. if only it weren't so expensive! 7. i'm really happy because dan has gained a little bit of weight and now he can fit into pants from regular stores and not just special order!!! 9. we ran out of milk and went to the walmart. all i can say is that they had their school supplies out and i couldn't help but get some things. i really love school supplies. who can resist spiral notebooks for 17 cents each!? i got 9 notebooks, 2 packs of index cards, 2 rolls of scotch tape, fresh pack of sharpies, and some (washable) crayons for miss ruby. that's pretty good for self control, right? 10. ethan's coming over tonight to do laundry. oh how things would have been different if i'd had an older sister when i was in college! i don't know if you're anything like me, but it's so easy to get caught up in the things that aren't perfect that you loose sight of the simple things that are. recently, we've been having trouble with our plumbing in this old house. we got a sprinkler system installed a couple of months ago and the weirdest things have been happening since. for example, sometimes when the sprinklers turn on the upstairs shower will start running and it can not turn off! dan says that we have a poltergeist. i just think we have a crazy house. the other day i flushed a toilet and the same thing happened with the shower. and the sprinklers weren't even on. anyway, we had to have all the water turned off in our house for about 36 hours while we waited for the plumbers to come. i know that these are totally "first world problems" but i get really angsty when i don't get a shower first thing in the morning. it is so tough to get moving and i just wind up sitting on the couch in my pajamas for most of they day. and ruby has been absolutely miserable with those molars. they are pretty much all the way through the gums, but she is still really uncomfortable. those two things combined to make a really tough day. this really was going to be a more positive post! the plumbing got fixed and ruby is happier today. what i'm trying to say is that it doesn't really matter if you get a shower first thing in the morning because that really doesn't matter. there are so many other things that are good and perfect. i am so lucky to be able to be there to comfort ruby when she is scared and hurting. i am lucky that we can call a plumber to solve our problems. it's so important to remember that these things that seem so bad are just a small blip in the general timeline of life. yesterday was our anniversary. four years. just four years seems so insignificant compared to all the things that have happened in this short amount of time. i can't really remember, much less imagine, life without dan. i really am the luckiest. happy anniversary, honey! 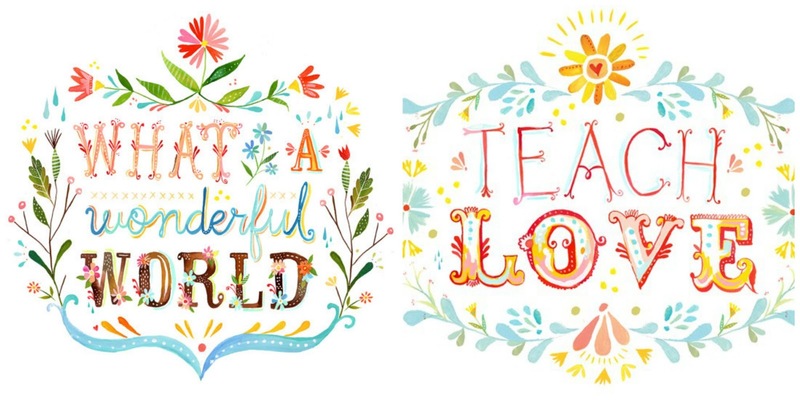 image from rifle paper co. - my new love! 1. this video might be the coolest thing i've seen in a while! it makes me really excited to take ruby in september. it also makes me wish i could have gone in the fifties. 2. ruby is so close to walking. she cruises along all the furniture and can even brace herself against the flat wall. i don't know how to feel about a mobile baby. she also can pretty much crawl up the stairs. which is funny because she still can't really crawl. 3. more on ruby: she's cutting all four molars. she is pretty much miserable. all. day. long. and the night too, now that i think about it. 4. 7-11 is this week! 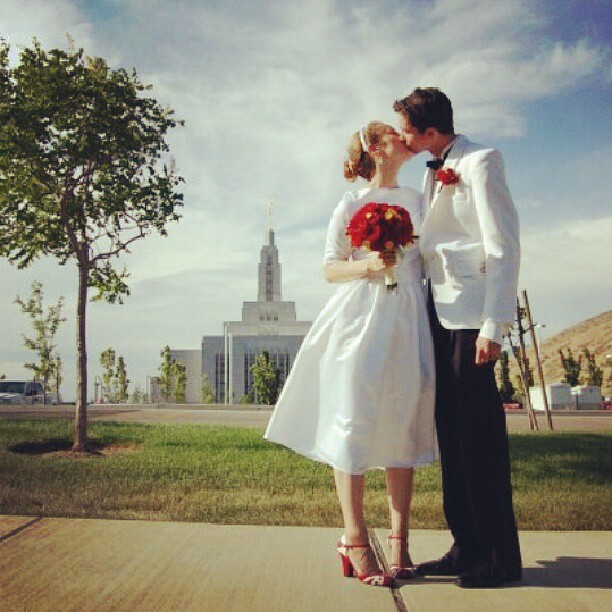 which means not only free slurpees, but 4 years of dan and candace. has it really only been four years? 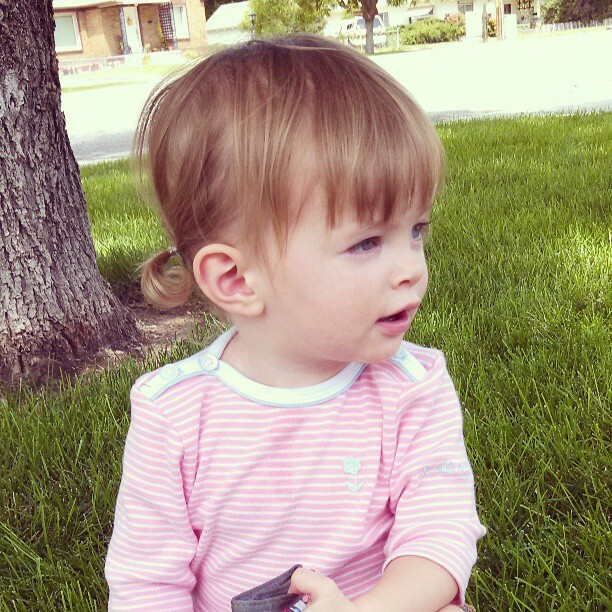 5. we spent the fourth of july in denver with dan's favorite cousin jason and his family. (i'll post more pictures from that later!) but, we came back with a souvenir! a fancy-schmancy bike trailer for miss roo! we have already been on a bike ride and it really is so much fun. 6. i really want to make this for our picnic table in the backyard. but i'm thinking more of a red - yellow - blue color scheme. 7. dandyroo designs has become a whole lot more legitimate over the last couple of weeks! i have business cards, a facebook page and have sold a few paintings to people i don't even know! you can sell stuff to your friends till doomsday, but when people you don't know what your stuff you know you've made it. and it's still fun so that's great! 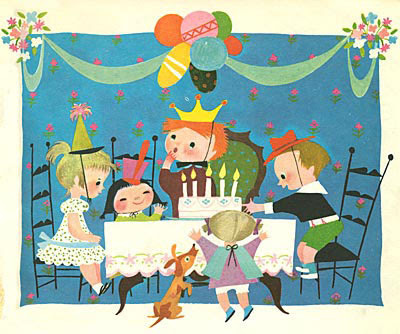 8. i still really want to do a favorite things party, but i just ran across this party and think it sounds like a perfect fall girl's soiree! 9. speaking of fall, dan and i have already started brainstorming costume ideas because we're just like that. but they're semi-top secret for a bit longer. these hot summer days make me crave cool, crisp autumn. 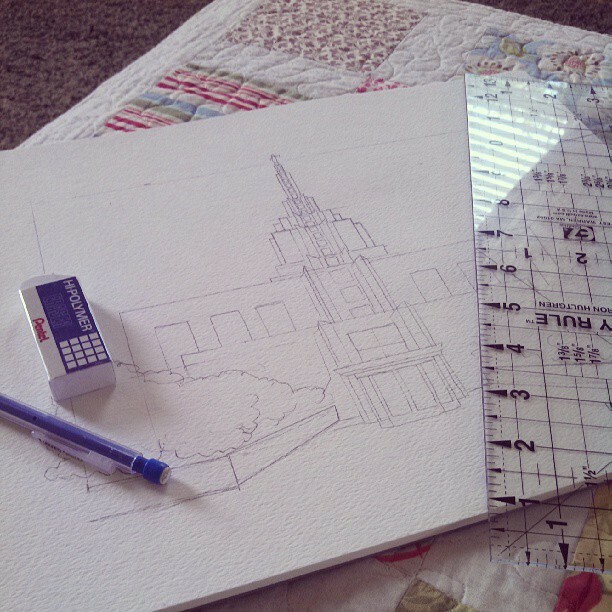 10. have you heard of the rifle paper co.? i pretty much love everything. it's really a good thing i have self-control. that's all i'm saying. is forty-five items too ambitious? nah. i don't think so! i'll check in again in september and tally up what all we've done. this summer is already so much better than last summer. 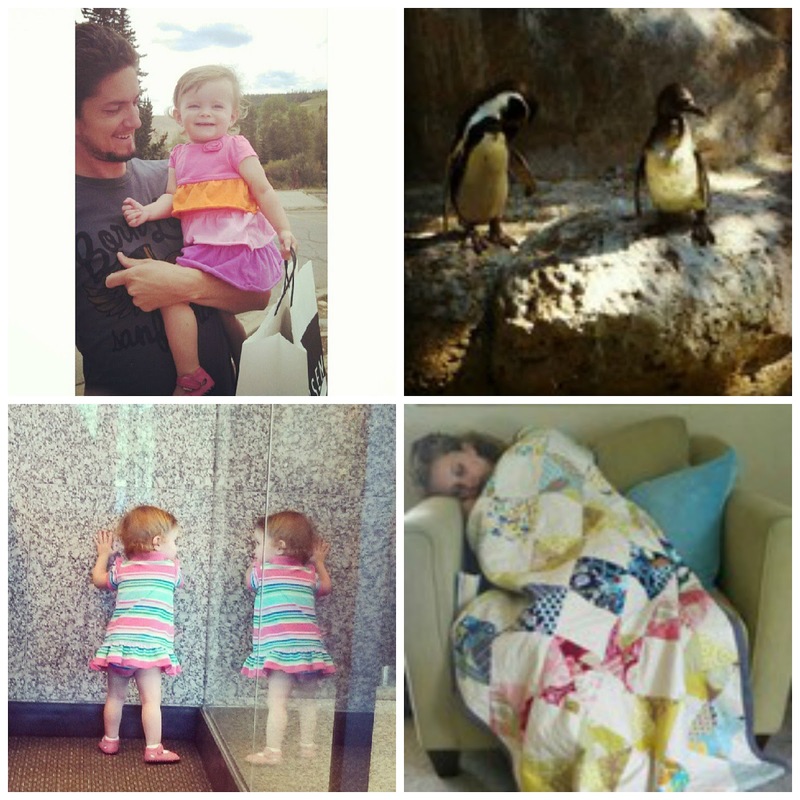 we loved little baby ruby, but toddler ruby is a lot more fun!